LiVE MAG! 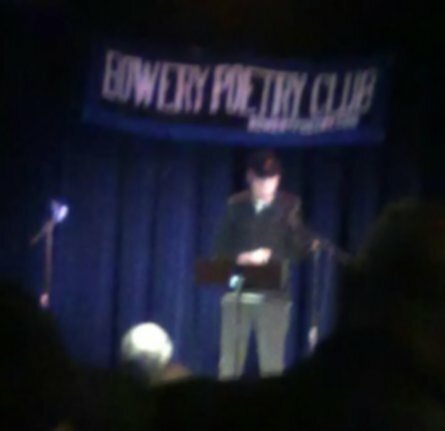 was born to run at the Bowery Poetry Club. Bob Holman and Jeff Wright conceived it as a performance / publication event created specifically for the Club. The earlier events from 2007 to 2010 featured editors of other publications as guests — eg, Hannah Winarsky, editor of Princeton University Press, William Electric Black of La Mama ETC., Michael Andre of Unmuzzled Ox, Bob Hershon of Hanging Loose and the late Akilah Oliver, the Monday night coordinator of the Poetry Project at St. Mark’s Church — who read their own works, some favorites, and then solicited poems from the audience to read. LiVE MAG! has evolved as an equal mix of art and poetry. In a unique partnership with La Mama, ETC, the magazine hosts an annual print publication party. Publisher and Editor, Jeffrey Cyphers Wright, moved to New York City in 1976 and began Hard Press, publishing poetry postcards and books. He attended workshops at St. Mark's Poetry Project with Ted Berrigan, Alice Notley and Jim Brodey. He went on to study with Allen Ginsberg at Brooklyn College where he earned a Masters of Fine Arts in Poetry. Wright launched Cover Magazine in 1987. Its contributors included Molly Jong-Fast, Timothy Greenfield-Sanders, John Yau, Robert C. Morgan, David Ulin, Jeanne C. Wilkinson, and KK Kozik. The 64 page monthly journal circulated nationally until 2000. Wright has reviewed poetry for the Poetry Project Newsletter and The Brooklyn Rail and wrote art criticism for Artnexus, Art & Antiques, Chelsea Now, the Villager, On-Verge and other publications. He has written 13 books of poetry (Ginsberg wrote a forward to his Take Over,) and appeared in numerous anthologies. He regularly exhibits and publishes his own artwork as well. Ilka Scobie, LiVE MAG! Associate Editor, is a native New Yorker, poet and art critic. She has written extensively for artnet and currently contributes to London's Artlyst. Recent poems have appeared in Poetry in Performance, Vanitas, and here/there. She was also Deputy Editor of Cover Magazine. Lori Ortiz, LiVE MAG! Associate Editor, has enjoyed an accomplished painting career and wrote arts journalism for trade and weekly publications in NYC. She is the author of Disco Dance. Aside from a 2009 certificate in Adobe Web Design from Pace University, and many SVA CE design and web development courses, she most recently earned a Udacity/Grow with Google Front-End Web Developer Nanodegree. Kim Power, LiVE MAG! Associate Editor, is a graduate of the New York Academy of Art (MFA in Painting, 2014). Her artworks have been exhibited in solo and group shows throughout the U.S., France and The Netherlands. Power has written for The Brooklyn Rail, ARTPULSE magazine, Art Aesthetics magazine and the blogs ArteFuse and Quantum Art Review. In May of 2018, she co-curated an exhibition of 31 artists for the Shirley Fiterman Art Center of the Borough of Manhattan Community College (NYC, NY) entitled Natural Proclivities. Power’s plein air paintings will be on exhibition in the spring of 2019 through Abend Gallery (Denver, CO) in a group show of artists from the Artists Off Grid residency in Red Feather Lakes, CO. Website Instagram and Instagram.